On March 22, 1814, the Mammoth set sail for Havana on a maiden voyage with commander Samuel Franklin and a large crew of 100 seamen. Built by Thomas Kemp in 1813 for $40,000, the Mammoth was the largest privateer schooner built in Baltimore at the time, weighing 376 tons and measuring 112′ by 28’3″ by 13’4″. When ship was commissioned on March 7, the ship’s owners included John Gooding, Samuel Smith, James Williams, and James A. Buchanan. With special thanks to volunteer Dennis Lilly and the Maryland Historical Society, we are excited to follow the first two voyages of the Mammoth from March through late October. The ship’s log acquired by the Maryland Historical Society in 2009 is likely a period copy of the original as the pages are clearly written and there are no water stains or other evidence of hard use from a long sea voyage. Over the next few months, you can stay tuned for more daily updates on the lives of the Baltimore seamen on board the Mammoth but if you don’t mind the spoilers we have a quick preview of the events that lie ahead for this schooner. Armed with 10 cannons, the Mammoth sailed to Havana where she unloaded her cargo then cruised the Caribbean, teaming up with two other privateers, to burn and harass the substantial English trade. In late spring, the Mammoth sailed north and put into Portsmouth on May 27 and stayed until June 23, 1814. The Mammoth’s second cruise began with a foray of burning English fishing vessels off the Grand Banks, where her attack on an armed English brig (probably the Sinclair) was repulsed. On October 10, 1814 she engaged in a long cannonade against an English transport, the Champion, which resulted in her capture. Mammoth transferred her cargo, and then returned the shot-up vessel to her commander. Franklin then sailed the Mammoth to Ireland, where she cruised, burning a number of captured vessels. She arrived back in Portland on November 15, 1814. This post is adapted from the Maryland Historical Society Finding aid to The Schooner Mammoth Logs, 1814 and The Schooner Independencia del Sud, November, 1817 – January, 1822 MS 3082. 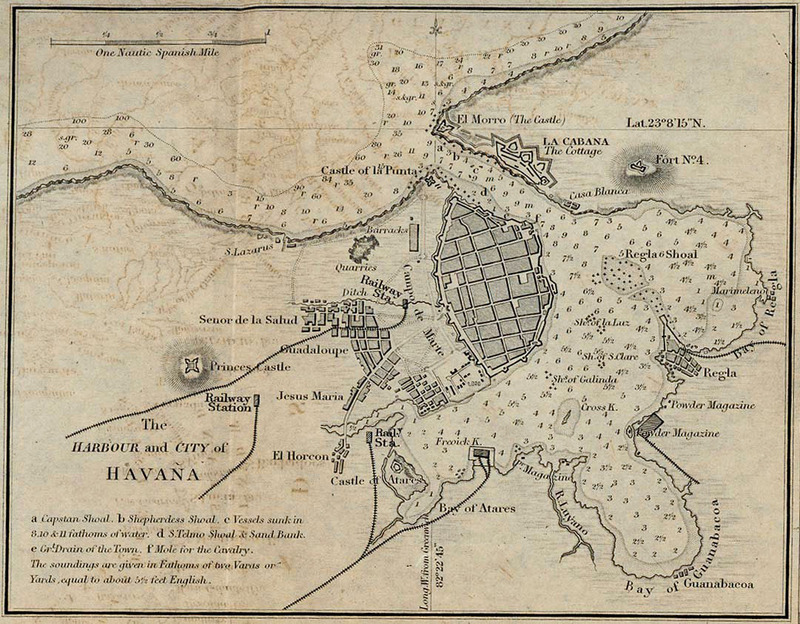 Havana Harbour and City, 1882. LEARN NC, 9277.